Well we originally planned to have 4-6 hens maximum. My hubby went looking for free coop plans and came across the plans from Purina. http://poultry.purinamills.com/NUTRITIONMANAGEMENT/HenHouseHutchDesign/default.aspx They looked simple enough so we decided to go for it. We didn't take any pictures during the main part of construction but it was very easy. We used 2x3's instead of 2x4's to try to cut down on cost and weight. I don't think it was worth it though since we had to be careful or the boards would split when we screwed them together. 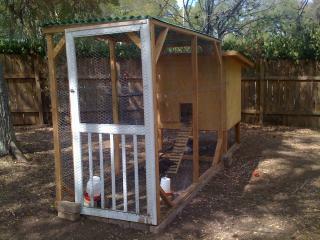 Here is the Coop with run attached. We found an old screen door on craigslist cheap. We had to cut the height down a bit, but it worked out perfect! The whole run (and screen door) is wrapped in chicken wire since daytime predators aren't an issue for us. The run is covered with green opaque corrugated roofing to provide some shade. I still need to raise the front a bit so water runs off properly. I also plan to fill the run with sand at some point and extend the run out to one side with a section that is covered in chicken wire so the sun shines through. I'd like for it to be about triple the size it is now. My hubby had a great idea to use little branches screwed to a board for the ramp. It turned out quite nice! It looks very rustic. 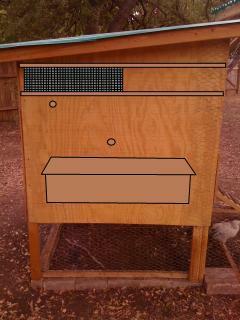 We will eventually add three nest boxes to the front just above the door as shown in the plans. 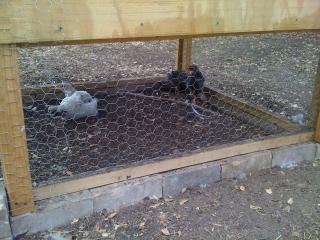 Underneath the coop is surrounded by chicken wire as well. In this picture you can see the coop is sitting on top of bricks to keep it level and off the dirt so the wood doesn't rot. The back of the coop is one big door that drops down for cleaning. Here is where we start to differ from the original plans. We SOMEHOW went from 4-6 birds to 7 instead. So we decided that we will add a second set of nest boxes. (like my modified photo?) I also plan to add more ventilation by cutting a hole towards the back of the coop that will have hardware cloth tacked on from the inside. Then there will be a track on the outside that will hold a piece of plexiglass in place the can slide open and shut to the side. I will have one of these on both sides. The two circles show where I will install tree branches into shower rod mounts. One next to the vent for maximum summer cooling, and one lower as well. 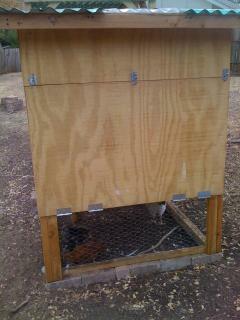 This picture shows the currently installed removable roost. 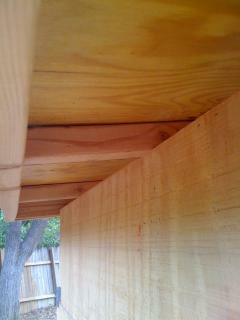 The bottom of the side rails are cut at an angle to match the floor. I mounted brackets on the floor (see next picture below) to keep it from sliding. 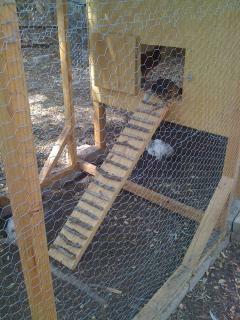 I wanted to keep the food and water in the right front corner of the coop without roosts above it. 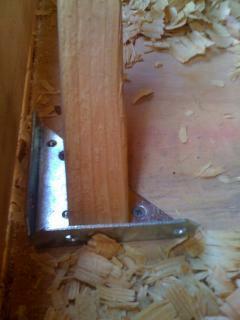 You can also see the removable board I put at the back so all the shavings don't fall out when you open the door. I'll try to get a picture of those brackets posted. We're currently using the deep litter method with pine shavings, but I plan to switch to rice hulls next year. 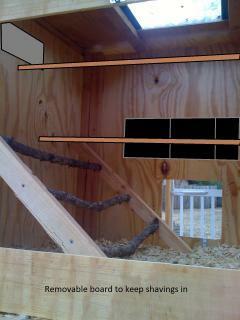 I drew in where the front nest boxes will be, as well as the permenant roost bars and vent on the left. 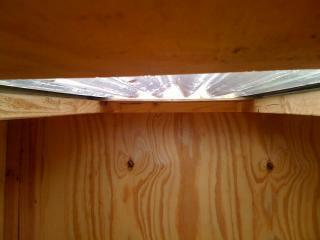 You can see the skylight that is covered with clear corrugated roofing. It lets in lots of light. Good job providing pictures and explanations. "Need the article to be finished please"